Say you wanted to send a Direct Message to someone who is not following you on Twitter. As all good Social media professionals know, it cannot be done. Well, not anymore apparently… Yup, it looks like Twitter is changing that, and in fact this might already be an option since 2011 for a select few verified Twitter users. Initially, the news began with some users randomly noticing a check-box in their account settings, allowing others to DM them freely… Then Mashable and The Verge picked up the story and there has been confirmation that this opt-in (or out) feature is being rolled out. The news comes amid other changes such as Twitter’s Emergency messaging feature. Please do no note that this is a very useful to people who are trying to get a hold of someone in customer service… and of course very useful for brands who want to conduct “private” conversations with people. As far as we are aware, the feature is on the way, but it will take some time for everyone to get it. What do you think about this? 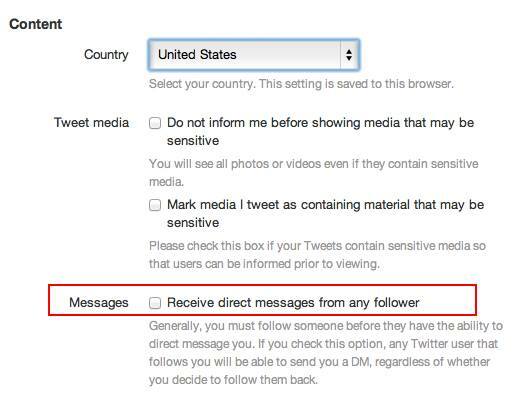 Have you found this setting on your Twitter account yet? Want More Retweets? Add Images to Your Tweets!